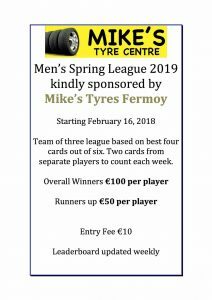 Entry is now open for the Spring League 2019, sponsored by Mike’s Tyres Fermoy. The league will be made up of teams of three players. Groups can enter as a team or as a single player and we will draw them into teams. Entry sheets are posted on the notice board in the locker room or click on the link below. The league will start on the February 16th and run until the end of March.